You can’t beat the taste of a bratwurst sausage. Our authentic German bratwursts are made with Old World care from the finest pork and seasoned with spices specially blended to give this sausage its unique flavor. Whether you fire up the grill or cook up the bratwurst on your stove, you will enjoy this delicious international meal. Ingredients: Pork, Water, Less than 2% of the following: Salt, Sugar, Potassium Chloride, Natural Flavors, Spices. Bratwursts are the life of the party. They are the perfect food for any gathering because everyone loves them. When you have a cookout, bratwursts always top the list of foods people request for lunch. When you hold a tailgate, everyone wants to bring the bratwursts as the main course. When you put on an after-work barbeque, your whole office will volunteer to cook the brats. Premio Foods offers exceptionally delicious bratwurst sausage as part of our world line. Bratwurst originated in Germany, which perfected the unique flavor and spices of this food. You can trace the popularity of sausage back to these German origins, and we strive to mimic the authentic taste of a German bratwurst by making our sausage in the traditional manner. We employ no fillers and instead rely on high-quality pork and natural flavors. Bratwursts pack a big wallop of protein, with 15 grams in each serving. You can make Premio bratwurst a staple in your kitchen thanks to that great nutritional benefit. Give kids the protein they need to grow strong while also feeding them a hearty bratwurst that will keep them full for hours to come. 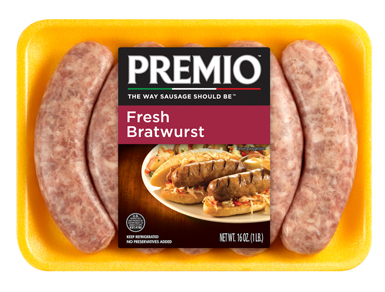 Everyone in your home will come to crave the singular flavor of bratwurst from Premio Foods. One reason people love sausage so much is its versatility. You can eat sausages for any meal. Fry up bratwurst for breakfast, as a hearty side to your plate of pancakes. Slice a few bratwursts for lunch and stick them in a veggie stir fry. Or toss a couple brats on the grill at dinnertime, grab some corn on the cob and chop up a watermelon for an easy dinner. We built Premio Foods on the idea that service to our customers can set us apart. When we started our company more than 40 years ago, we did so based on the four pillars of family-owned business of yesteryear — we pledged commitments to quality, our customers, our employees and our community. We still follow those guidelines. We encourage our employees to give back to their community, and we do the same by supporting food banks, cancer fundraisers, Special Olympics and more. Those old-fashioned values remain relevant today. When you buy bratwurst sausage from Premio Foods, you support a company that cares. We want your family to enjoy the best food, and we want our community to thrive. Families are the backbone of society. Draw closer to yours by nourishing them with good food, great conversation and frequent get-togethers. And make Premio Foods bratwursts the life of that party.